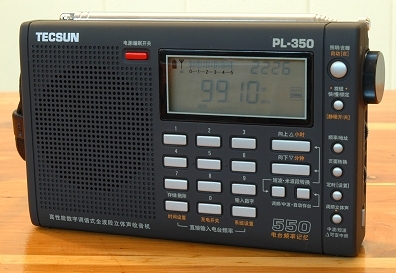 Another new radio is now available from Tecsun, the PL-350. This new model has been heralded as an “update” to the already-available PL-550, its larger brother. In some ways the PL-350 has been improved…most noticeably in terms of RF sensitivity and spurious response rejection, in which areas the PL-350 clearly outperforms the 550 on many signals. It is also a logical upgrade to the smaller PL-200. If you look at the picture of the three Tecsuns you will note they appear to be extremely similar in terms of layout. Cost in March, 2005 was $44.90 plus $20 shipping by air from China. Interestingly, this is exactly the same price as the slightly larger Degen DE1103 which I will compare it with later. It is $8.00 less than the still larger Tecsun PL-550 and only about $3 more than the very small Tecsun PL-200 . Power Source: 220 volt AC Adapter included, also recharges 3 included AA cells in the radio, or 3 AA Alkaline cells (not included) (You will need an inexpensive 120 volt to 220 volt step-up transformer in the US and Canada). Owner’s Manual: Most Chinese eBay sellers provide an English translation as a PDF file immediately upon purchase, otherwise my assumption is that you will receive a Chinese Owner’s Manual. 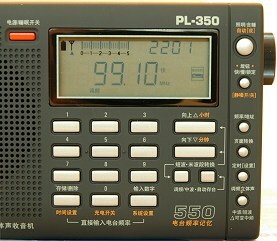 Note: As you can see in the pictures, the PL-350′s controls are mostly in Chinese, so the English translation of the manual is a handy reference until you get to know the radio. My past experiences with other Chinese labeled radios is that I eventually become comfortable with them without referring to the English translated manuals, but it is a bit inconvenient and may be a bother to some users. It’s something to be aware of before you buy. At the moment this model is not being marketed in the US in an English labeled version. On a more positive note, the control layout on the PL-350 closely resembles that of the PL-550 and PL-200. The Eton US import versions of these are the E-10 and E-100, and manuals for those can be downloaded from the Eton site. You will be able to operate the PL-350 with any of these as guides, but the System Set tables differ in some details. More on the System Set menus later. I was immediately impressed with the new, charcoal black rubber-like covering on the PL-350. It gives the radio an extremely satisfying, solid feel and it looks striking indeed. This radio gives a feel of quality and solidness that is re-assuring. I installed 3 AA alkalines so I could use it right away rather than charging the rechargeables first, and proceeded directly to the System Set mode to set my preferences. The only changes I had to make from the defaults were to change the AM steps from 9 KHz to 10 KHz for North America, and to change the battery type setting from rechargeables to non-rechargeable. The manual suggests that the only difference in the battery type selection is to allow for accurate battery level indication. Next I programmed in my favorite stations…an easy task following the manual. Once they are programmed you can access them in several ways, by spinning the tuning knob or by direct address entry, and of course, as a true digitally-tuned radio you have the standard choice of seek/scan or manual band-scanning at either Fast or Slow speeds. There is some muting during tuning when on the Fast setting but very little muting when set to Slow Tuning mode. However, this muting can be defeated completely via use of the system Set Codes…the first radio I’m aware of that allows the user to control this function. It is also easy to switch quickly between memory scanning and regular manual tuning. There are two levels on control locking available for convenience. You can hit a front panel lock button which de-activates only the tuning knob, leaving all other functions available. This is handy for preventing accidental miss-tuning while carrying the radio. Alternatively there is a total lock switch which locks all functions. Its primary use is to prevent accidental draining of the batteries when packed in luggage. The PL-350 is a fun radio to use, with solid performance, easy tuning and volume control, and several user-friendly features which are advancements over earlier models. For instance, the back light is set by default (although you can modify this setting) to operate automatically between 5 PM and 8 AM whenever any control is operated. You can also use the light by momentarily pressing the light button for about 5 seconds of illumination, or you can hold the button down for an extra second to lock the light on. Even so, when you turn the radio off or when it turns off automatically from sleep or timer modes, the light will go off, unlike some other Tecsuns in which the light will stay on until you turn it off – a nice touch that will help save your batteries. The recharging feature has also been updated. Although it is still not fully as “smart” and automated as on the better stand-along chargers, you don’t have to set the charge time each time you charge the batteries as on some other recent sets. Instead, you simply set the radio for the capacity of the cells you are using (the PL-350 is currently shipping with 1100 m.a. cells). Thereafter, you only have to hit one button to initiate the charge cycle and the rest is automatic, including a low-level trickle “top off” charge after the initial charging phase ends. According to the manual this maximizes battery life and playing time by assuring all cells are fully and equally charged. I hope future models will advance further to the fully automated design where individual cell condition is analyzed and charging parameters automatically compensate for each cell, but that would probably cause too much of a price increase at the current state of the art. After all, those sophisticated chargers cost almost as much as the PL-350! I found the Tone control to be useful, although it has to serve in place of a narrow bandwidth option. Still, the single bandwidth seems to be a good balance between sound quality and selectivity, making the PL-350 very easy on the ears in general use. Generally you will not hear heterodyne squeals as you tune around at night when bands are most crowded. The antenna trimmer functions similarly to that in the PL-550. It seems that the same setting is best for all shortwave stations which makes me wonder why we need to be able to control it…an internal adjustment pot would seem to serve as well, assuming it would be properly adjusted at the factory. It is possible this setting might differ with an external antenna which I did not test. At any rate the control is easy to adjust and it does assure best sw reception. I also noted that using the antenna jack does not disable the built-in ferrite rod for am reception…typical of inexpensive portables. The IF Shift function allows you to eliminate unwanted images caused by the PL-350′s single conversion design. Generally, engaging the switch will totally eliminate the interference. Unlike the PL-550, PL-350′s IF Shift feature works on both AM and SW. Also, when you engage the shift on the PL-550 you also engage the narrow bandwidth whch may not be the one you want to use. This problem doesn’t exist on the PL-350 because it has only one bandwidth…a limitation becomes a plus! On/Off functions work similarly to other Tecsuns. If you press the power switch briefly the radio turns on in Sleep mode and will automatically shut itself off after a specified time period. You can set the default sleep time to be anywhere from 1 to 480 minutes so each time you engage the feature it will remember your favorite setting. Or, when you turn the radio on you can hold the Power button for an extra second to bypass the sleep function and turn the radio on permanently. The PL-350 uses System Set Codes to adjust several operating parameters just as in the PL-550 and PL-200. With the radio turned off you hit the System Set button twice to enter the Set mode. Then you simply enter a two digit number from a table to set the particular parameter. Settings include the number of memory pages and the number of memories per page (in any case you have 550 memories which is way more than I can deal with). Also settings are available for MW (9 or 10 KHz steps), 12 or 24 hour clock, rechargeable or non-rechargeable batteries, rechargeable battery capacity and FM frequency coverage). You need the manual to set these properly, but once they are set you can forget them. Regardless of how many features a radio has, to me it all comes down to performance first. The PL-350 has been rumored to address some of the PL-550′s issues, and because it is priced the same as the Degen DE1103 comparisons to that model are inevitable as well. I was personally very interested in how the new PL-350 would perform as I was somewhat disappointed with the PL-550, while I have been very impressed with the DE1103 except for its awkward volume control arrangement. Here’s what I found. Sensitivity: The PL-350 falls smack dab in between the PL-550 and the DE1103 overall. On AM and SW the PL-350 exhibited lower background noise on medium and weak signals than the ’550, but was hissier than the DE1103. I would say the gap in performance was about equal…the 550 being the worst, the 350 a bit better and the DE1103 a bit better still. The effect did vary slightly from station to station. On some signals the DE1103 had virtually no background hiss compared with the two Tecsuns, on other noisy signals the differences were much less obvious. However, when there were differences, the DE1103 was always the best, the PL-550 always the worst and the PL-350 was always right in the middle. It would seem that Tecsun could and should update the PL-550 with the enhanced reception offered by the PL-350 – that would make the 550 a much nicer radio. Selectivity/IF Bandwidth & Audio: The PL-350 employs a single IF bandwidth. Perhaps for that reason, its apparent bandwidth was slightly narrower than the PL-550 or the DE1103 in their wide modes. This means those two radios both produced more high frequency response in their audio which resulted in a crisper, clearer sound. Vocal sibilants were more clearly rendered on the PL-550 and DE1103 and music had more high frequency overtones, as well as better low frequency balance for a larger, fuller sound. The DE1103 also had noticeably lower distortion giving cleaner audio that is more natural sounding than either of the Tecsuns. On the other hand, both the PL-550 and DE1103 revealed some heterodyne squeals when tuning in crowded bands at night unless they were switched to their Narrow modes which are considerably narrower than the PL-350′s single bandwidth. The more one compares radios with different IF bandwidths (as well as pricier radios that offer multiple bandwidths), it becomes clear that unless you have multiple bandwidth choices available, the one bandwidth must be chosen carefully, as it is a trade off between crisp audio quality and reasonable selectivity to separate stations easily and prevent extraneous noises and squeals. I think Tecsun got it exactly right in the PL-350. Taken on it own its audio is pleasant and listenable and I think that for this size of radio the audio quality is good, and it is noticeably stronger and fuller than the smaller PL-200. FM Performance: As I’ve mentioned before I am not an avid FM listener but I did compare the three radios on FM to see if there were any obvious differences. Once again, The Degen DE1103 was clearly the superior performer. I was able to hear a few out of town stations that were hard to receive in the clear on either of the Tecsuns. Also, even when the stations weren’t being obviously interfered with by adjacent locals, it was less fussy to achieve non-distorted reception on the Degen…the Tecsuns seemed to sputter and spit more easily as I played with their antenna orientation. To keep this in perspective I will say that for the majority of my typical local and suburban FM signals, all 3 radios did just fine, so unless you are into FM DXing I think the FM sections are fine for general listening. A more FM-concerned listener will probably want the Degen though. All of these radios sounded very nice when listening through stereo ear buds. Overall I am very pleased with the new PL-350 and can recommend it heartily to anyone who is looking for a smallish, low priced digitally-tuned AM/SW/FM portable. Other than the Chinese labeling the radio has very good ergonomics (a big weakness of the otherwise excellent Degen DE1103 with its somewhat cumbersome volume control arrangement which many users find annoying). The PL-350 clearly offers improved performance over its PL-550 predecessor in terms of RF performance. My ’550 also shows spurious noises (whistles and tones) on many of my semi-local AM stations which are completely absent on the ’350. The PL-550 still offers much more powerful audio in a larger package, so if sound quality is more important than small size (and if you don’t experience difficulties with your local AM stations on it) there is still good justification for that model. For me it then comes down to the Degen DE1103 versus the Tecsun PL-350. The Degen is dual conversion, and therefore does not need the IF Switch feature of the PL-350. The Degen also offers SSB reception which neither of the Tecsuns do. I have to say the DE1103 is a better performer overall with a lower rf noise floor, dual bandwidths, and an obviously cleaner sound on AM and SW, and slightly better FM reception too. On the other hand, the PL-350 has a traditional volume control lacking on the DE1103, it’s a bit smaller, has that terrific rubbery finish, as well as a simpler, faster recharging system….and I love the ability to lock the dial light on when running on batteries. Which would I recommend to a friend? Hmmm…that’s a toughie. If the DE1103 had a regular volume control I would have less hesitation saying unequivocally that it is a better choice…RF performance is clearly superior. But many people dislike the ’1103 because you need two hands or multiple key strokes to set the volume on it, and if you think you would fall into that category I suggest you carefully consider the Tecsun PL-350.